OT is obviously awesome so the ideas behind it have pretty much always been present throughout time in one way or another. 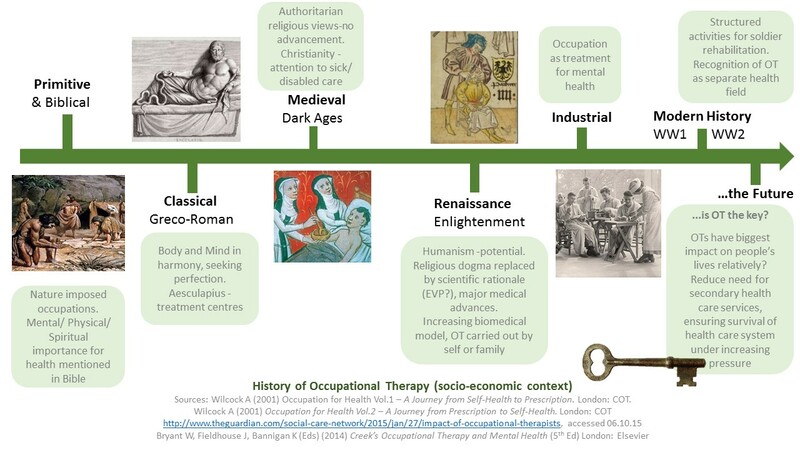 Below is a summary of Occupational Therapy’s position throughout the ages. Primitive age There was an emphasis on community support within tribes, with Shamans providing ‘interventions’. Nature imposed occupations on people in order for them to survive- if you did not find occupation through making fires, hunting food or making shelters you would not survive for long. Biblical age Jesus is described as valuing all people equally. There was an awareness of the importance of all forms of health. With mental health this could be raising self esteem and equality, such as talking face to face being preferred over letter writing in John chapter 2. Physical health is mentioned eg the use of therapeutic baths, such as in John chapter 5 where Jesus heals using the Pool of Bethesda, and of course spiritual health was a running theme since Jesus was a fairly spiritual guy and frequently took time out for meditation. Classical age Philosophers proposed the idea of body and mind being restored or maintained in perfect harmony. A balance between physical activity/occupation and rest was encouraged. The physician Aesculapius founded treatment health centres which had gyms, spa baths, horse riding activities and theatres, providing a holistic approach to treating both physical and mental illness ahead of its time. Spiritual cures such as snake venom were also frequently used (incidentally this is where the medical symbol of a serpent on a staff originates). However in seeking this perfection, infants with disabilities which could not be cured were killed as there was no hope of restoration, and perfect harmony was impossible. Renaissance ‘Enlightenment’ The appearance of Humanism which was a philosophical view emphasising a human’s potential and dignity, and was a return to classical thinking. Humanism encouraged people to identify and develop their potential. Age of Reason– An increase in the number of physicians meant authoritarian religious beliefs were replaced with scientific rationales (possibly the beginning of Evidence Based Practice!?). It was a time of many medical advances such as the discovery of blood circulation (1628) and anatomy (1543). With all these biological discoveries there was a focus on the biomedical model; Occupational Therapy activities and mental health care were carried out by the self and family. It was the start of the philosophy of OT: autonomy, liberty, self-realisation (‘fulfillment by oneself of the possibilities of one’s character or personality’ aka realising your potential). Industrial age A time of philanthropists emerging who provided health and well-being facilities for their workers. ‘Occupation’ began to be used as a treatment for mental health conditions. Modern History A need for rehabilitation of WW1 and WW2 soldiers for manpower saw use of occupational activities increase. In 1917 the profession is named as “Occupational Therapy” when the American OT society formed, and later in 1936 the UK OT society was formed.